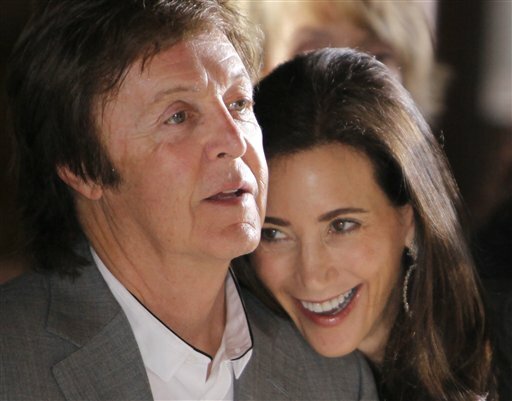 The Beatles legend is set to tie the knot with the American businesswoman at the Westminster Register Office in London, where he and Linda Eastman wed in 1969. Official Banns – proclamations announcing a couples' intention to wed – were posted on Wednesday (14.09.11), allowing the couple to wed 16 days afterward. They are expected to marry at the venue, also known as Marylebone Register Office, next month. Nancy is said to be keen on having a small wedding for family rather than a huge lavish affair. The couple's engagement was announced in May, with Paul, 69, giving Nancy, 51, a vintage 1925 Cartier engagement solitaire diamond ring worth £400,000 and she admitted the proposal came as a "total surprise". When asked about the wedding, she previously said: "Small. Just our families. I don’t know the exact date. Don’t ask what I’ll wear. How dressy do you get to stand before a Justice of the Peace in his chambers? Which is what we’re going to do." When Paul and Linda wed, hundreds of fans lined the streets to try and catch a glimpse of the ceremony. The pair lived happily together until Linda's death from cancer in 1998. Paul married for a second time when he tied the knot with ex-model Heather Mills in a lavish affair – rumoured to have cost £1.5 million - in 2002, but they eventually divorced in 2008 following an acrimonious break-up. Paul is a father to four grown up children, including fashion designer Stella McCartney, from his marriage to Linda and he also has a daughter, seven-year-old Beatrice, from his marriage to Heather.